Paperback, with flaps, 160 pages, 17.0 x 24.0 cm, 6.7 x 9.4 in. 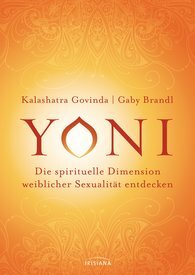 In yoga philosophy, the concept of yoni refers not only to the female genitalia, but also in particular to spiritual feminine energy. Through various techniques, such as classical yoga and breathing exercises, meditations, and mudras, this feminine power can be consciously discovered and allowed to burgeon. A crucial role is played by chakra massage, by which the lower three chakras – love, life energy, and pleasure – are stimulated.